This giant challenge course features our 22ft Vertical Rush component combined with a 40ft seven element course. 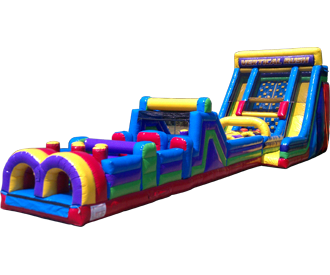 The 40' obstacle coarse comes in a cool 5 color design and is one of the best 7 element designs in the industry today featuring pop ups, log jambs, squeeze walls,crawl tubes,rock climb & slide. The Verticle Rush is a climb wall and slide with crawl tubes at the start so race through the tubes and up the wall around to the slide and down you go with super steep angle to get maximum thrill. Even the big kids and adults will love this one.